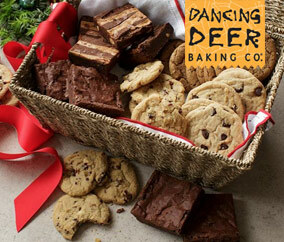 With award-winning brownies, cakes, and cookies, Dancing Deer is known for its innovative and delicious baked goods, made from scratch using the highest quality wholesome ingredients. The Brand’s artful but simple packaging is colorful, honest, and boldly creative. Whether you're buying your favorite sweets to indulge in yourself or choosing a unique gift basket for your friends and family, Dancing Deer has the perfect gourmet choice for you.